Getting a new puppy comes with a feeling of excitement even for people that do not know much about dogs. These little animals require a lot of attention and care to keep them healthy while ensuring that they are not a danger to themselves and other pets or humans. They have a rapid growth rate, and being fully prepared before acquiring a new puppy ensures that you enjoy your time with them as they grow. Knowing the right supplies that you must have before bringing home a new pet is very important as shopping for their needs can be laborious and quite confusing. These things are essential and will make life easy for both the puppies and dog owners, even if it is their first pet. Although there are loads of different pet supplies in the market, this guide will enable you to focus on the important things that will make you a happy and fulfilled dog parent. Dogs have different personalities and may exhibit unpredictable behavior hence the need to prepare your home before bringing a new pet into it. Making a list of the essential supplies that you require will ensure that the process of bringing in a new puppy into your home is not an exhausting one. Here is a list of things you need for a new puppy. There are countless other dog supplies in the market but these ten things will enable you to have a thrilling dog parenting experience. Puppies need top-quality food to enable them to stay healthy and grow at a steady rate. There is dog food that is specially formulated for puppies under the age of one. They contain the necessary nutrients in the right amounts needed for the proper growth and development of puppies. Puppy food is different from adult dog food as it contains more nutrients required for rapid growth and good bone formation. You should consider talking to your veterinarian before changing your dog food as the puppy may already be eating a particular brand before you acquired it. It is advised to continue with the type of product the puppy was weaned unto unless it is difficult to find in your area, then you can gradually make the change. Suddenly changing the dog food type may slow down the rate of growth and development of the puppy as they may refuse to eat the new product for days. It is also important to note that the food product for puppies of larger dog breeds is different from that of smaller breeds. Endeavor to buy the correct type of food for the breed of dog you have. These foods usually contain proteins as the main ingredient which supports lean muscle development. It also contains other nutrients that help boost the immune system and aid the proper development of other parts of the body including the brain and coat. Puppy treats are also important as training begins early to help you enforce good behavior. They make your job easier as they can be used to reward dogs for good behavior in positive reinforcement training. These treats should be healthy and soft enough for puppies to chew with their little teeth to avoid choking. There are also treats that help relieve teething pains in young puppies. Endeavor to buy the best product to ensure that you and your puppy remain happy. Good puppy food and treats can be found on Amazon at an affordable price. Feeding your puppy is a must for all dog owners. They will need to drink water too for the proper functioning of their body organs. Several types of food and water bowls can be found online or in your favorite pet retail shop. These bowls are made of different materials which could be stainless steel, plastic, ceramics or even glass. Puppies need to eat at least three times per day and require a daily supply of clean drinking water. The plastic bowls are an affordable choice but they tend to collect bacteria more than the other options, hence the need to replace them routinely. When the plastic begins to wear away, food residue may begin to collect on scratched surfaces which supports the growth of bacteria and other disease-causing organisms. Glass and ceramic bowls are heavy and may break easily. They are also quite expensive but are easy to clean. Endeavor to buy products that are dishwasher safe and do not contain materials like lead that may be harmful to your pet. Bowls made of stainless steel are usually preferred as they are durable and easy to clean so that you do not have to worry about it harboring bacteria. They are also lightweight and can be easily carried by the puppy in its mouth. These puppy feeders come in different sizes, designs, and colors to match the type of décor you have in your home. There is the non-tip bowl design to ensure that it is not knocked over by the dog. The non-slip dish design ensures that there are no crumbs scattered on the floor while your dog eats, thereby saving you the trouble of sweeping the feeding area. For dogs that eat very fast, you may consider buying the Fun Feeder bowl that has built-in mazes designed to slow down the time it takes your pup to finish a meal. This helps to improve digestion and prevents obesity. Water bowls can be placed on waterproof mats to control spillage. 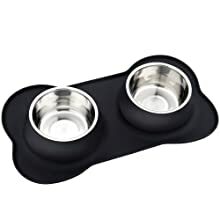 Good food and water bowls can be found on Amazon including elevated feeders and custom bowl holders. The dog gate gives you the ability to control areas in your home that are accessible to your puppy. Dogs are very curious and tend to wander around the house littering everywhere with fur. They also tend to chew on furniture, clothes, and shoes when they are bored. This unpleasant chewing behavior may lead to damage of important materials causing health hazards around the house. Puppies tend to poop on furniture, carpets and other odd places in the apartment when they are initially brought home. These gates help restrict their movement while enabling you to train them properly and efficiently. With dog gates installed in strategic locations in the house, you get the freedom to perform other household activities without having to worry about what your puppy might ruin next. You rest assured that they are in a confined area where they are safe and there is no risk of injury while you are away. These dog gates come in different shapes and sizes. They are usually made of metal wire panels which may be foldable along the frames to enable you to expand or set it up in the way that is suitable for your home, and for easy storage. There are retractable gates too. Suitable gates for puppy-proofing your home may be found in nearby pet stores or on Amazon. Crates are very important for every dog owner. It is ideal for housing your puppy for easy supervision and training. Crates or carriers enable you to keep your pet close while traveling long distances. With this equipment, you do not have to worry about your dog wandering off in the middle of the trip. These crates are made of a wide range of materials including fiberglass, plastic, and stainless steel. Although fiberglass and plastic crates are lightweight and easy to carry, those made of stainless steel are more durable. 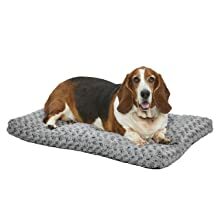 They all have a sturdy build with enough openings for ventilation and can be fitted with blankets or soft beddings to make them cozy and comfortable for your pet. A good crate or carrier should have enough room for your pet to stretch, stand or turn around easily while inside it. Those with a wide mesh is not ideal as the head of your dog may get caught in it. Your pet’s favorite toys should be placed inside to enable your dog to play with them when bored. These crates may be placed in the middle of the room with the door open to allow the dog to inspect it freely. Gently place your puppy inside the crate while it is sleeping while leaving the door open. You may start closing the door when you observe that your dog has become comfortable with staying inside the crate. The puppy should not be left inside the crate for long hours. They should not be placed in crates as punishment for bad behavior. Place treats inside the crate so that your pup can associate it with a happy experience. When the dog defecates in the crate, it should be cleaned immediately and foul-smelling beddings should be replaced to ensure that your pup remains comfortable. Beds are essential to keep puppies warm, comfortable, and away from cold floors. There are dog carriers that can both double as a permanent bed and a means to carry your pet with you while traveling. Dog beddings should be soft and made of water repellant material that does not soak up urine. It should be easy to clean as odors from urine or dog poop can be very unpleasant. Getting your puppy to stay on its bed at first can be a daunting task. They can be taught to enter and stay in the bed using positive reinforcements. The beds may be made of leather or fabric tailored towards having your new puppy feeling safe and secure the first time you bring it home. They come in different shapes and sizes and you may acquire one according to the size of your pup. Collar and leash is an important accessory for new dog owners. They make it easy for you to maintain control over your puppy while taking it for a walk and during obedience training. Dogs require routine exercises to remain strong and healthy both physically and mentally. Collars are usually worn around the neck and have a provision for attaching a leash and identification tags which may contain the name of the dog and contact details of its owner. They usually have buckles for adjustment to ensure that your pup remains comfortable while wearing them. Make sure that you buy collars that are made of soft materials. They should be adjusted not to fit too tight to avoid injuries to the throat of your puppy from excessive pulling. You may also choose to buy a harness if your puppy is having problems with the collar. The leash should be strong and made of materials that do not snap easily due to the dog chewing on it. It should have a soft grip for easy handling that does not injure the hand from friction due to excessive pilling by the dog. Long leashes are efficient for use during obedience training. You can get good collars and leashes made of reflective materials for improved visibility at night. This helps prevent people from bumping into your puppy during evening walks. Puppies love to play and they adore toys. These toys come in different shapes, sizes and designs design to suit different needs including those that dispense treats. There are chew toys that are made of tough material which is helpful when your puppy is in the chewing phase. There are others that help improve critical thinking while training your dog and stuffed animals for added comfort. Chew toys help prevent your dog from chewing on other valuable materials in your home. These toys may not be safe for your pets when damaged as exposed stuffing or pieces of the toy may choke them when mistakenly swallowed. You can also play fetch with your puppy using flying discs and balls to make up for their daily exercise needs. Endeavor to buy the right size of toy for your new puppy to keep it happy. Identification (ID) tags and microchips are essential to help identify lost dogs. The ID tags are usually made of metal or plastic which can be hung on the dog collar. They contain specific contact information to help notify a dog parent when their missing puppy is found. You may just include your name, contact phone number and the name of the puppy on the ID tag. A microchip is quite different. It is a small device that can be injected into the shoulder of the dog by a veterinarian. It contains a code that can be used to locate the contact information of the dog owner on a database. Dog parents should endeavor to register and update their information on the database to make it easy for animal shelter staff to reunite them with their missing pet. The code on the chip can be read using a handheld scanner. ID tags can be bought online. Visit your veterinarian for further advice on using microchips. Regardless of the size of your dog, it requires routine grooming to ensure that its coat is clean and healthy. Proper bathing and trimming of the fur of your puppy will help ensure that it is free of disease-causing organisms and parasites like fleas and ticks which can cause skin irritation and other severe health issues. It may be expensive to visit a grooming salon whenever you need to groom your pup. Doing it at home will save you a lot of money while improving your relationship with your pet. 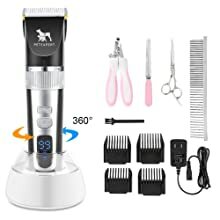 All you need is the right tools and an understanding of the basic grooming requirements and techniques for trimming, brushing or bathing your new puppy. You may also need to clip its toenails and brush its teeth. Here are a few tools that you may need for effective dog grooming. Dog brushes for removing tangles, mats and loose hair from the coat of your dog. Hand dryer for drying the fur after bathing. Dog toothpaste and toothbrush for brushing its teeth. Nail clippers for trimming overgrown toenails of your dog. Scissors for trimming your dog fur. Dog shampoo for bathing your dog. The grooming tools that is required is dependent on the type of dog breed you choose to adopt. Dog brushes, for instance, could be slacker brush, pin brush, rake or bristle brush. Puppy grooming kits can be found on Amazon. Bathing your dog at least once a month helps keep their coat clean and eliminates the strong hound smell. It also helps remove debris or other particles that may be trapped under its fur. Using the right shampoo helps make bathing your pup easy. Good dog shampoo is mild and does not cause drying or irritation of your dog’s skin. There are natural shampoo products that are safe and affordable. They can be found in local pet stores and on Amazon. Being a dog parent requires patience and consistency while training the pet to act in the desired way. Most dogs require early socialization to enable them to remain happy and confident. Moving into a new environment can be stressful for dogs, hence the need to ensure that the new home is cozy and comfortable. Now that we have covered the right products to acquire before bringing home a new puppy, you can go ahead and enjoy playing with your pet without any worries.